An important part of the Mt. Shasta Trail Association’s mission is to provide inspiring outdoor experiences and advance appreciation of the beauty of the Mt. Shasta area. Toward that end, we offer information on trails in the Mt. 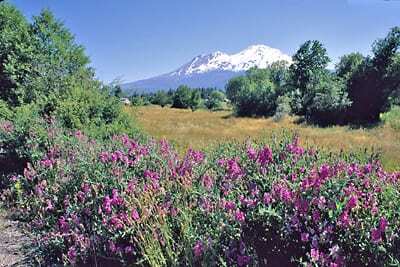 Shasta area, encouraging you to discover new places to hike and enjoy. The trails are categorized by geographical area, all within approximately 50 miles from the summit of Mt. Shasta. Click on the Trails Guide tab in the menu above, and then let your mouse pointer go over the desired region, and finally, click on a specific hike to open a separate page. Click here for more information on getting maps and books to facilitate your trail adventures. Hiking trails and driving to trailheads entails certain potential dangers. We describe how to get to the trail and how to stay on the trail. However, you need to be prepared for anything and everything that nature and people can do to you. You bear responsibility for your actions and their consequences, not us. That said, prepare well and then get out there and explore and enjoy!